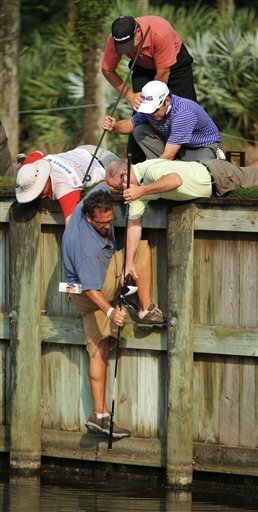 Yesterday in second round action of The Players Championship at the seventh hole, Michael Bradley's driver slipped right out of his hand and went right into the water. And not only that, it was rescued by a good samaritan who was able to fish it out of the water with another club as Bradley and Louis Oosthuizen watched on. Can't make this stuff up folks. To the videotape.